A new innovation in the world of diesel engines is getting its start right here in Sanborn County. 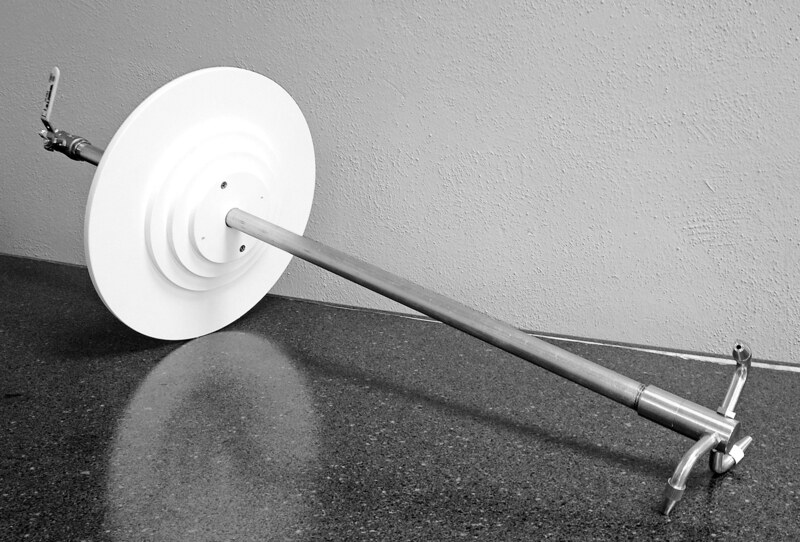 The Diesel Air Filter Cleaner was invented after Shawn Peterson got tired of spending time cleaning air filters with a regular air compressor wand and an idea popped in his head. That led to hours of trial and error building prototypes and dealing with a language barrier with a Chinese engineer. Finally, after about a year, and realizing they would have to add moving parts to the design, Peterson and his partner, Al Westendorf, created their first Diesel Air Filter Cleaner. Their design is currently in the patent pending stage. So now the duo, along with a few employees, are busy promoting and selling the product, traveling around to farm shows, fairs and conventions. Their sales pitch boasts the cleaner can save five gallons of fuel per hour and can pay for itself in one day. It works on multiple sizes of radial seal filters, is said to work at a completely safe psi to not damage the filter and it can make the filter last longer. Peterson says about 100 cleaners have been sold so far, following the three days of Dakotafest and they have high hopes for a good showing at the State Fair this weekend. Their factory, currently located in a cleaned out hog shed, can handle a little more demand, but Peterson and Westendorf are hoping to eventually expand their operation. During the early development stages there came a point the two thought they were dead in the water. They came across a similar product a man in Idaho was attempting to build. This cleaner didn’t yet have a rotating nozzle, therefore didn’t work well. Once Peterson and Westendorf added their nozzle, they immediately contacted a patent lawyer and began the long process of getting the invention under patent. Peterson says right now all but one part on the filter cleaner are made here in the US, and they are working with a machinist to produce that part. To learn more, they can be found online at www.dieselairfiltercleaner.com. They will also be at the State Fair in the inventors booth towards the north end of the fairgrounds, near the swine building and right across from Double D Western Wear. The opening game of the football season was a disappointment for the Blackhawks as they fell 14-22 to Hanson in the last few seconds Friday night at Woonsocket. Jordan Marquardt caught one in the air from Tyler Pringle for a 29-yard touchdown for the Hanson Beavers, which broke a tie game in the final seconds of the fourth. Marqwardt ended with 17 carries totaling 74 yards for the Beavers. 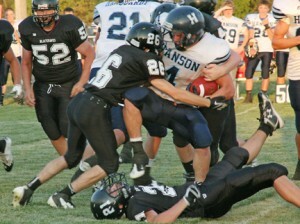 He also collected 10 tackles to lead Hanson’s defense. Tyler Pringle hit 3-for-4 in passing for two touchdowns and 94 yards. Jacob Paradeis collected 155 yards in 14 carries and had one touchdown. For the Blackhawks, Todd Stekl went 14-of-21 for 234 yards including one touchdown and two interceptions. Davion Brooks racked up six catches for 129 yards while Trevor Easton carried the ball for 43 yards in 13 carries. 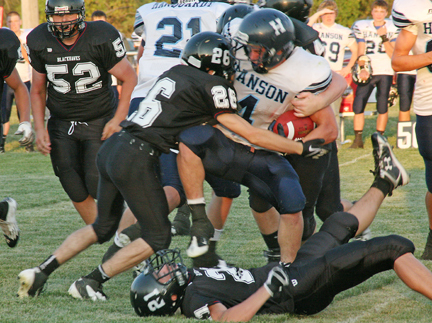 Branden Jones logged 11 tackles and Austin Messmer picked up 10 tackles to headline the Blackhawk defense. WWSSC totaled 234 yards in the air and 80 yards on the ground. The Blackhawks will host Kimball/White Lake at Forestburg field this Friday. Feeding of 5,000, feeding South Dakota! The followers of Jesus gathered to hear Jesus speak and were fed not only by his word but with the miracle of five loaves and two fish. It is a story that has been told and has nourished us through the generations. Today we are called to be the hands of Christ and carry the story to fullness with the feeding of our neighbors… the feeding of South Dakota! The communities of Sanborn County have the opportunity to be the working hands of Christ and feed those who are hungry in our area. On Sept. 9 at 9 a.m. in the community center everyone is invited to a Community Worship Service coordinated by the Lutheran Methodist Parish. The service will focus on hunger and the offering received will be for the Sanborn County Food Pantry. According to the Pantry, the most needed items at this time include: non-perishable items with expiration dates well into the future, paper towels, laundry soap, peanut butter, dry foods and tissues. Offerings of cash to purchase specific needs are welcomed as well. The challenge is to receive 5,000 items within the offering to meet the multitude of needs. Will we meet the challenge? Homemade ice cream and pies will be served. Leftover pie and ice cream will be auctioned off as a fundraiser for the Food Pantry. Make plans now to attend the Community Celebration for Feeding South Dakota! !